Containment: Your puppy has been introduced to a plastic dog travel kennel so that they are comfortable being in one. I often keep it in their play area, once they learn to walk and they have learned to think of it as a den, or hideaway where they are safe. You will probably want to use a travel kennel too, for night time or when you’re away, especially at first. If you are flying your puppy to you, I provide a plastic travel kennel with your flight kit, otherwise they are available at most pet stores. If you choose a wire crate, sometimes it's more comforting if you cover the sides with a blanket so it feels more "den-like". A blanket that smells like you can also be a comfort. I will send a small blanket along with you when you leave Gallant Farm that has been “scented” with mom and siblings to comfort your puppy during those first nights away, while he makes the transition from my home to yours. I also recommend having a small pen or area set up for your puppy to exercise (inside or outside), although it’s not technically necessary. My favorite kind seems to be a black, fold up wire kind about 40” tall. It’s handy to use in the house, to block off certain areas, and is easy to move around. They are available for about $60 online. Potty: Many books have been written on this subject. It’s important, since no one wants to deal with accidents longer than we have to. Your puppy has been using a litter box (with puppy pads, litter or newspaper inside it) at my home since before he was weaned, and I recommend it, instead of just puppy pads on the floor, for one major reason-- puppy pads seem to confuse dogs and you may never have a safe rug again if you use them, since many dogs seem to think all rugs are puppy pads. A litter box is a little more unique, and plus, the scent control is better. I do often use puppy pads INSIDE the litter box, but the physical barrier seems to make all the difference in keeping my rugs unsoiled. I definitely recommend having one available to your puppy immediately when you arrive home, and always after that until you are sure he is totally housebroken. The less you move it around, the better. Also, if you start to see accidents, make the play area smaller until he remembers that the litterbox is where he goes to potty. Many people say that puppies are able to hold their bladders one hour for every month of life up until 6 months, so it’ll be awhile before they are ready to hold it too long. It's best when going potty outside, to have a specific area outside that is the potty area. That way, when they get tot he area, they know that's what you want them to to do. Frequent trips to the potty area (outside, or wherever you plan to have it) are good, and of course, the standard rule: when he goes potty—it’s a BIG, HAPPY deal. When he has an accident, it’s not a big deal. Being consistent at the beginning with potty training, will make a huge difference later. Training: Cotons are VERY smart and trainable. You will get much further with a positive training method with these dogs, since they are sensitive and can and will have hurt feelings from negative feedback. I would recommend finding a good puppy obedience class. Not only does it help you learn to work with your dog, but it socializes them too, with other dogs and strangers, which is a GREAT thing for everyone. I sometimes use a small dog e collar for training, I use the kind that doesn't "shock" the dog, but instead beeps or vibrates. They are very effective and can certainly be used without being cruel. The best effects come from using a beep for a positive reward. Vibrate is best used for a negative feedback, but should be used sparingly, to just get the dogs attention, and redirect. Always start out training with the dog on a 30 ft leash, for safety until they understand what the e collar is telling them, otherwise they can get scared, run away, and completely botch the training session. Before using the collar, watch a few videos on youtube about how to train with one. You'll find with dogs that don't have a high food drive, it can make training much faster and more reliable than treat training. Veterinary: Lastly, I will recommend finding a good vet, as soon as possible to make sure you start off on the right foot with your new puppy. He will need a puppy series right away, and to maintain good health with things like Flea and tick preventative (to prevent Lyme disease, etc), heart worm, deworming, and vaccinations. He will also need to be neutered by 6 months of age, per our agreement, unless other arrangements are made with me. 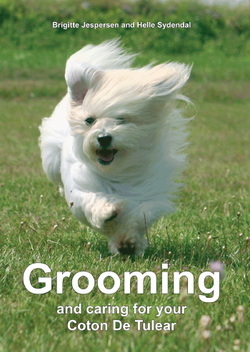 ​A helpful, lovely book if you plan to groom your own Coton de Tulear. The official American Coton Club Calendar. ​The best Coton de Tulear calendar to be found! *** This section is being moved to the "grooming page"
If you could only have one grooming tool, I would suggest a good comb. Combs are the most effective for getting down to the skin and removing loose hair to avoid tangles. Espana Shampoo & conditioner works better overall than anything else I have found. Available all over the internet, and at many local pet stores. If you can comb your dog (down to the skin) every few days you will save yourself a lot of hassle with tangles. If you don’t like grooming, or you get behind a bit and end up with mats, you can have the groomer give your dog a puppy cut, schnauzer cut, etc. to make life easier. There are also many DVD's video instructing how to groom your dog properly yourself. It takes a few times to get confident with it, but overall can save a lot of money on groomers. Well, that’s about everything I can think of, although I am happy to answer any other questions you may have at any time.